What Would You Do if a Gunman Opened Fire? Two work for the Department of Defense as contract security officers - the other for an undisclosed law enforcement agency. 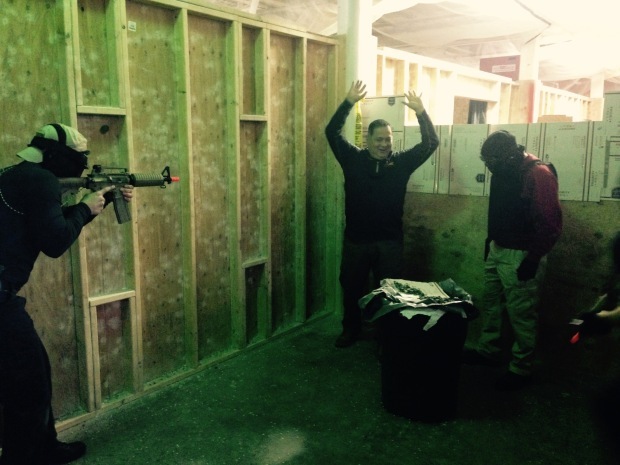 In the wake of the San Bernardino attack, they're sharpening their skills with active shooter training at space inside Extreme Sports in Walpole, Massachusetts. "Every minute during an active shooter situation… is another victim," said Sgt. Joshua Carajanes, a security officer for the Department of Defense. "A lot of these people it may just be a situation of keeping score - a body count, if you will," trainer Rich Kuong of Kilo 1 Applications Group said. The officers say training like this is a must for law enforcement, but in this day and age, training for civilians has become critical too. "Depending on where in the country, what kind of agency - rural, city - it may take a long time for the police to arrive. People have to do something to save themselves," said retired Massachusetts State Police Lt. Bruce Lint, who now runs a security firm. Gunmen hit soft targets like schools, theaters, or a luncheon spot for a reason. There's easy access, less security, and few people - if any - with weapons. According to FBI statistics, the average active shooter incident lasts 12 minutes - more than a third are over in five. Lint said people must do everything to run, hide or fight. "Loud noises, fire extinguishers, scissors," he said. "You want to make sure you know where the exits are, scan the crowd. If you see something suspicious - see something, say something." Kuong said there are few options in a theater or open conference space. "If you can't get out, you really have no choice at that point," he said. "If you don't fight, you're going to die. It's that simple."